Photograph, Picture of a chemical plant near the Texas Coast. at night. Courtesy of Sea Grant Texas. Image available on the Internet and included in accordance with Title 17 U.S.C. Section 107. CHEMICAL INDUSTRIES. Though "chemical industries," broadly defined, would include such industries as cement production, the sulfur industry, the cottonseed industry, the salt industry, and the oil and gas industry, the term is here considered as applying to those industries engaged in the production of chemical compounds most of which find industrial use directly or by further conversion. The production of chemicals in Texas makes up the largest manufacturing industry in the state. Chemical industries did not get a significant beginning in Texas until World War I. After a brief recession at the end of the war, the industry rose steadily until by 1925 state production figures showed that the value added by manufacture through chemical processes reached a total for the year of $1,126,000. Chemical production, exclusive of oil, salt, gas, and food industries, was the twenty-eighth ranking Texas industry. Legislative grants made in 1937 and 1938 to the Bureau of Industrial Chemistry at the University of Texas were repaid by the discovery of a number of new processes for the chemical utilization of Texas raw materials. Between 1939 and 1949 more than $750 million was invested in chemical plants in the state. During World War II with the development of petrochemical units to produce synthetic rubber and other strategic materials, the industry saw its biggest growth in the shortest period of time. After 1950 the enormous proliferation of the industry placed it first among all Texas manufactures in value added. Capital investment for new chemical-manufacturing plants and equipment totaled about $457 million in 1965-more than 40 percent of all new manufacturing investment in the state. In 1989 capital expenditures for the chemical and petrochemical industry accounted for 51 percent of manufacturing investment in the state. Photograph, Picture of plant operators at an Enterprise refinery in Mont Belvieu, Texas. Image available on the Internet and included in accordance with Title 17 U.S.C. Section 107. In the United States Census Bureau's classification Chemicals and Allied Products, the number of production workers in Texas increased from 6,847 in 1939 to 17,475 in 1947. A total of 433 establishments was included in this classification, and the value added by manufacturing in 1947 was given as $234,496,000. In 1968 the Texas chemical industry employed more than 60,000 workers, mostly in the coastal area. The Houston vicinity, including Freeport, Bay City, and Texas City, had the heaviest concentration of plants. Second in size was the chemical industry of Beaumont-Port Arthur-Orange. Other major centers near the coast were Brownsville, Corpus Christi, Victoria, and Seadrift. Total chemical-plant investment in 1968 within a 150-mile radius of Houston was estimated at $7 billion. Inland centers of chemical production during the 1960s included Big Spring, Borger, Denver City, Longview, Odessa, and Pampa. 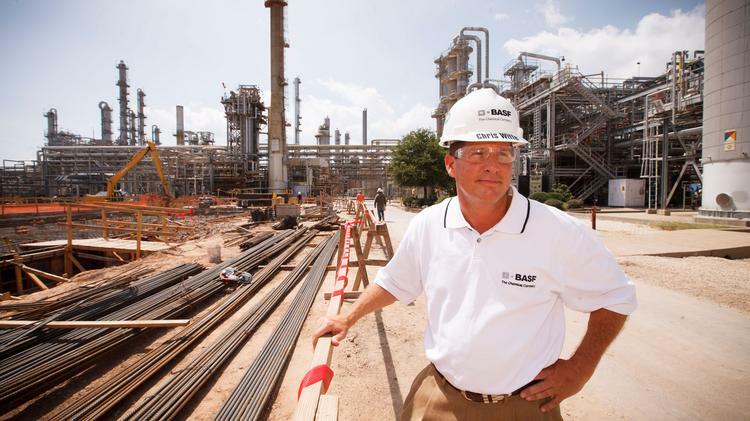 Photograph, Picture of an employee at a BASF company in Freeport, Texas. Image available on the Internet and included in accordance with Title 17 U.S.C. Section 107. Historically, the principal growth of the chemical industry has been along the Gulf coast, but during the 1940s there were plants engaging in the production of soap and edible oils, sulfuric acid, and various synthetic catalysts in the Dallas area, while in the Laredo area antimony metal and antimony oxide were produced (see ANTIMONY SMELTER). In the 1990s, the industry continued to be concentrated on the coast and employed more than 116,000 people in 1992. Inland plants operated in Borger, Longview, and Midland. Chemical products accounted for 24 percent of the value of all manufacturing shipments in Texas, according to a 1989 survey. Producers of chemicals also led the state in paying the highest hourly wages. Workers in both petrochemical and chemical plants averaged between $16.92 and $18.69 an hour. Newspaper clipping from the Corpus Christi Caller-Times in 1951 claiming the oil industry, and the Carthage Hydrocol Co, to be a great success. Courtesy of Newspapers.com. Image available on the Internet and included in accordance with Title 17 U.S.C. Section 107. 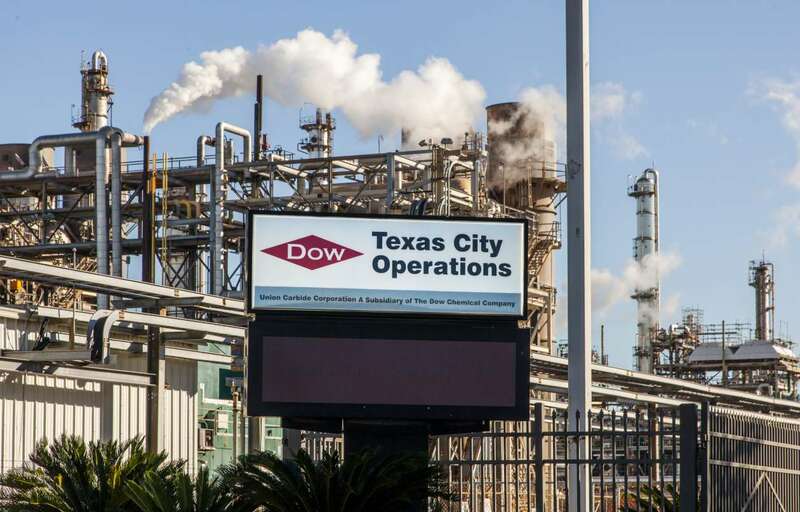 Photograph, Picture of Dow Chemical Co. in Texas City. Image available on the Internet and included in accordance with Title 17 U.S.C. Section 107. In the Brownsville area after World War II Carthage Hydrocol Company produced high-octane gasoline, alcohols, and other oxygenated materials. The Corpus Christi area also had a number of plants producing acetic acid, formic acid, and formaldehyde (Hoechst Celanese Corporation of America); soda ash, caustic soda, and chlorine from local salts and oyster shells (Southern Alkali Corporation); and corn starch, oils, and other corn products from milo maize. A $52 million plant for the production of electrolytic zinc and cadmium was also located in the Corpus Christi area, and near Port Lavaca ALCOA ran a large plant converting bauxite to aluminum by an electrolytic process. In the 1950s Wharton County sulfur production (Texasgulf and others) was the largest in the world (see SULFUR INDUSTRY). During the 1930s Dow Chemical Company invested more than $100 million in facilities at Freeport for a wide range of chemical production. The only tin smelter (see TIN SMELTING) in North America was located in Texas City, as was a carbon black manufacturing company. Monsanto Chemical Company, which operated out of Texas City originally, currently has plants in Alvin near Chocolate Bayou. Immediately after World War II a large variety of chemical industrial plants in the Houston area produced hydrocyanic acid, phosphate fertilizers, electrolytic chlorine, and caustic soda (Diamond Alkali-Diamond Shamrock), anhydrous hydrofluoric acid, sulphuric acid, and superphosphate fertilizers, hydrochloric acid and bone black, freon, phenathiazin, and DDT (DuPont-Grasselli Division), and ammonium sulphate (Phillips Chemical Company, a subsidiary of Phillips Petroleum). Shell Chemical Company also built and operated a $50 million plant for diversified chemical and petroleum products and research. At Baytown in conjunction with Humble Oil and Refining Company (now Exxon Company, U.S.A.), the largest petroleum refinery in the United States at the time, there was a toluene plant and a butyl rubber polymerization plant. In this area also General Tire and Rubber operated a large synthetic rubber plant (see SYNTHETIC RUBBER MANUFACTURE). In the Beaumont-Port Arthur-Orange industrial triangle, plants produced a variety of petrochemicals and organic chemicals, butane, synthetic rubber (B. F. Goodrich and Firestone Chemical Companies), and oxygen. McCarthy Chemical Company in Baytown operated the largest oxygen plant in the United States. 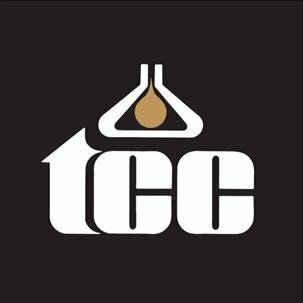 Logo of the Texas Chemical Council. Image available on the Internet and included in accordance with Title 17 U.S.C. Section 107. Major companies in operations in the 1990s included Dow Chemical, E. I. DuPont de Nemours and Company, Hoechst Celanese Chemical Group, Incorporated, Occidental Chemical Corporation, Quantum Chemical, ARCO, Huntsman Chemical Corporation, and Union Carbide Corporation. Many companies that manufacture chemicals in the state are also members of the Texas Chemical Council, the Austin-based state trade association of the industry. Most of the new chemical plants after 1960 fell into one of three broad product categories: petrochemicals, based on oil and gas; industrial inorganics; and finished products, such as detergents, paints, and medicinal preparations. The greatest growth has come in the first of these three. Photograph, Picture of a Shell Chemical Co. worker onsite. Courtesy of Shell Global. Image available on the Internet and included in accordance with Title 17 U.S.C. Section 107. Petrochemicals. The largest-volume petrochemical product was ethylene, produced in more than a dozen Texas plants, most of them along the coast. Ethylene is an intermediate product, used in the making of dozens of chemicals. Some of these were polyethylene, made in larger amounts than any other plastic, vinyl plastics, styrene plastics and rubber, and cellulose acetate, as well as solvents, cleaning agents, antifreeze compounds, and many other products. The preparation of most of these petrochemicals was carried on in several phases, often in different plants, which were frequently connected by pipelines. The term "spaghetti bowl" has come into use to describe the elaborately interconnected production complexes that have grown up along the Houston Ship Channel and the Sabine-Neches Waterway and Sabine Pass Ship Channel. Texas produced 70 percent of American ethylene production in 1989, making it the fifth largest producer in the world. Synthetic rubber, pioneer product of the state's petrochemical industry, was made in larger volume in 1968 and in a wider range of types than ever before. Ten Texas plants, along the coast from Houston to Beaumont-Port Arthur and also in Borger and Odessa, turned out various polymers and copolymers for use as rubber. In 1970 Texas produced 80 percent of the nation's synthetic rubber. Some of the basic building blocks of the petrochemical industry were compounds that could be separated or derived from either natural gas or petroleum: ethane and ethylene, butane and butylene, propane and propylene. Others, such as benzene, toluene, and xylene are produced only from oil. In spite of the occurrence of oil and gas in almost all parts of Texas, most petroleum refining was carried on along the coast, where low-cost water transportation could be used. The petrochemical industry, closely tied technologically and economically to refining, developed principally in already established refining centers. 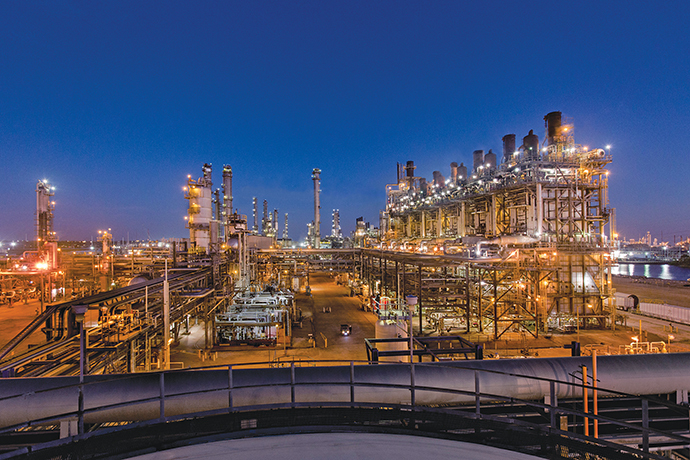 Photograph, Picture of ExxonMobil's largest ethylene production facility in the world, located in Baytown, Texas. Courtesy of Site Selection Magazine. Image available on the Internet and included in accordance with Title 17 U.S.C. Section 107. Most major Texas petrochemical products were organic chemicals, but a few were not. Synthetic ammonia, made from the hydrogen contained in natural gas, was in rapidly increasing demand for use in agricultural fertilizers. It was made not only in the Houston area but also in East Texas and on the High Plains, where demand was strong for agricultural chemicals. Texas has been the leading state in production of fixed-nitrogen fertilizers, chiefly ammonia-based. Carbon black, used largely in tire rubber, was an important product of the Texas chemical industry. In the past most of the carbon black plants based their production on natural gas and were located in the gas fields of the Panhandle. However, the grades of black in demand for use in synthetic rubber in 1968 were more readily made from oil, and the industry has moved to the Gulf Coast, where petroleum-based feedstocks can be purchased from the large coastal refineries. Sulfur is a Texas petrochemical to the extent that large amounts have been recovered from hydrogen sulfide-bearing natural gas, mainly in the Permian Basin and Panhandle gas fields. Similarly, helium was extracted from natural gas at Amarillo, Dumas, Gruver, and Masterson, which were close to gas deposits that contained enough helium to justify its extraction. Industrial inorganic chemicals. Aside from petrochemicals, the state's largest-volume chemical outputs were generally those derived from salt, sulfur, sea water, oyster shell, and other raw materials drawn mainly from reserves along the Gulf Coast. These inorganics include chlorine, soda ash, caustic soda, and sulfuric acid, all of which figure very importantly in a wide variety of chemical process operations. In 1963 Texas plants shipped more chlorine (valued at $23 million) and more caustic soda (valued at $36 million) than plants in any other state. Most of this came from production centers in or near Corpus Christi, Houston, and Port Neches. Finished chemical products. The end products turned out by the chemical industry in Texas have fallen mostly into three categories: detergents and soaps, paints and varnishes, and pharmaceutical chemicals. Output of these products has been more heavily concentrated in Dallas than in any other Texas city. In fact, one Dallas plant accounted for most of the state's total employment in soap manufacture. In 1993 there were 167 producers of soap, cleaners, and toilet goods in the state, with $1.2 billion in gross sales. The making of paint and related products was a significant manufacture in Dallas and particularly in Houston. Seventy-eight paint plants in Texas shipped products valued at $118 million in 1963. In 1988 there were ninety plants that had gross sales exceeding $281 million. In 1993, the number of plants dropped to eighty-five but gross sales exceeded $416 million. After World War II the Texas drug industry was small and rather specialized. Substantial quantities of veterinary medicines were produced and also some synthetic organic chemicals for medical use. However, there were no major production centers in 1968. In 1987, seventy-one manufacturers in the state reported gross sales of $432,774,592. By 1993 there were eighty-seven producers of drugs in the state reporting revenues of more than $1 billion. In response to the growing community concern about chemical pollution, several chemical companies joined Clean Industries 2000, a voluntary program of the Texas Natural Resource Conservation Commission, to reduce various types of pollution to 50 percent of 1987 levels by the year 2000. Members improve environmental management within their corporations and adhere to environmental regulations. Companies also organize and participate in various environmental outreach programs and projects. Texas members include Phillips 66, Howell Hydrocarbon and Chemicals, DuPont, and OxyChem. See also CARBON BLACK INDUSTRY, and HELIUM PRODUCTION. M. A. M. Anari and Jared E. Hazelton, The Chemical Industry of Texas (College Station: Center for Business and Economic Analysis, Texas A&M University, 1992). Texas Chemical Council, The Texas Chemical Industry (n.p. : Union Carbide Corporation, n.d.). Texas Water Commission, Clean Texas 2000 Environmental Partnership (1992). Handbook of Texas Online, Robert H. Ryan, "CHEMICAL INDUSTRIES," accessed April 20, 2019, http://www.tshaonline.org/handbook/online/articles/dmc01. Uploaded on June 12, 2010. Modified on October 21, 2016. Published by the Texas State Historical Association.